It is very soft, and came as a real surprise, even we talked about it, but that was more than a year ago. I had to google about bees wax wrapping – i have missed that – thank you for enlightening me on the newest package material! What an exciting thing! Keeping goats and sheeps has been my dream for the few last years, I envy you with your sheeps! I will envy you even more if you get a couple of goats. Goats are great fun, even if they are mischievous and smart little beasts. You are very kind – wanting so send me presious angora fiber. I will send you back something made out of it then. Oh, sent my comment before finishing – a blanket or a scarf is in my mind. Thank you for peeping in here. Oh wow, shiny! What an amazing gift. Yes, shiny and very long-lasting gift. Oh, such a beautiful package… Inside and out! : ) Where did you get this drum carder, and the other beautiful instrument? I would really like to know. Thank you. I bought it via shop in Denmark, they have dealers in some other countries, but not in Sweden where I live. 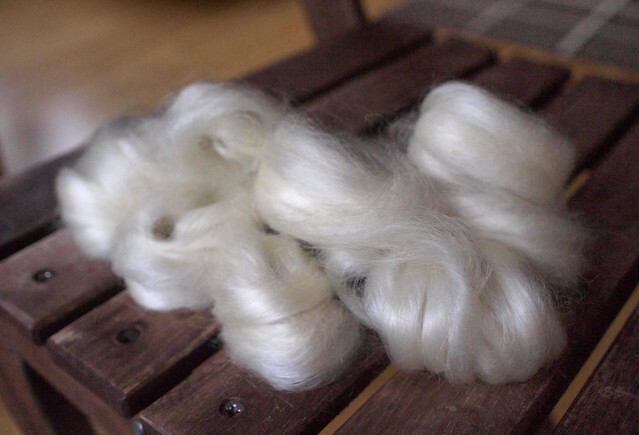 it is for fine wool and fiber, they have different carders for different fibers and purposes. I bought it in Sweden, I think they have dealers everywhere now. Hope it is been to help! Marie-Josée, it is totally OK that your blog is private and you won’t add me as follower, you don’t even have to explain it. And I will be very happy if you peep in here wherever you want and ask or say something. I am glad you found the links useful. Thank you for understanding. But it really isn’t a private blog. I just decided to close it, and not feed it anymore. If I ever start a new one though, I’ll send you an invitation for sure! The fiber is so soft and fluffy looking….. and the yarn you spun is simply beautiful! I was very happy when I got it! Thank you! Thank you! the time interval between the first and the last picture is a month or so, but it is absolutely worth it! What a pity we can´t touch it! What a unique package, thank you for your sharing. Wow! What a beautiful gift and wonderful packaging. When I was in India last year I think I sent four packages home, and they were always wrapped in cloth and then sealed with wax. It looks like it comes from a different time, not a different country! I feel quite nostalgic about that kind of packaging, the cloth could be washed and re-used for another parcel and also I remember that postal staff would get very happy when people brought back used peeled off wax seals, which could be melted again and re-used – as frugal as it can go! It is another time! Thank you! To tell you the truth I got so fixed on the idea of weaving something of handspun yarn that I never even thought about using something else for a warp, I will think about it, specially overshot! Thank you for stopping by here and letting me to discover your blog and wonderful things you are making! There’s nothing wrong with being that kind of frugal – I wish we were more used to doing that today! I kept all the wrappings from my Indian packages – stamped (rubber and postage), handwritten all over, drippy wax and string… They are wonderful objects. lovely, it looks like angel hair and will be soft and warm for a blanket/wrap. In Canada the P.O. won’t take parcels tied with string! It is very soft fiber, but it becomes extremely strong yarn, unbreakable. I saw you had some mohair fiber in your stash, what would you make out of it? In Canada they probably have more strict safety regulations – in case string goes off and things get tangled or something. 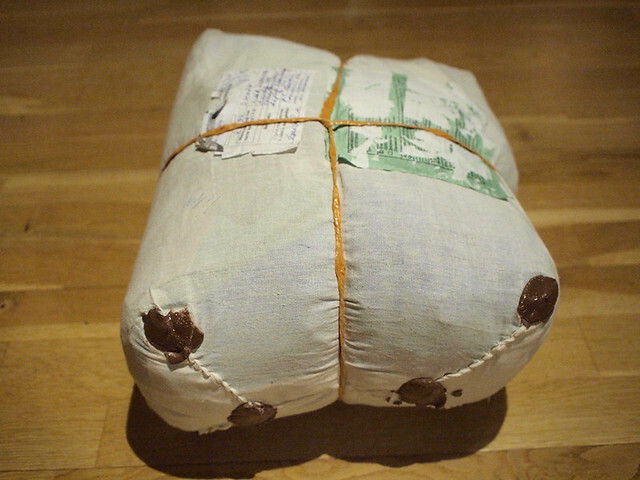 Even though string makes parcels easier to handle for postal people. Wow what a treasure. So lovely. Absolutely gorgeous – superb spinning! Thanks! Need more yarn for a blanket! The sheen is gorgeous. What a great gift and I really liked the interesting packaging. I keep on spinning it little by little and enjoy it very much!